Garden Notebook – A Bed of Roses | Faddegon's Nursery, Inc.
May 30, 2017 | Garden Tips, Perennials, Shrubs, Trees & Vines, What's New? ‘Violet’s Pride’ introduced by Weeks Roses is a floribunda worthy of a prize. Inspired by the Countess of Grantham in the popular Downton Abbey series, ‘Violet’s Pride’ shares elegance and strength with its namesake. Lavender petals with a deep magenta heart spiral together in these fully double blooms while the bush itself is vigorous and evenly rounded. The flowers have a wonderful fruit-like fragrance similar to grapefruit mixed with hints of spice. Hybridized by Christian Bedard for Weeks Roses. We are in love with the colors on this new rose! Mature height: 3-4 ft. with a width of 3 ft. I love this garden phlox. ‘David’ is a long blooming white flower held high on tall stems. To see it begin to come up and bloom amid roses and other flowers gives me a thrill every summer. ‘David’ is highly resistant to mildew problems and a definite favorite of perennial gardeners. It will bloom right into September so you’ll have lots of time to enjoy it. Garden phlox are fragrant and great for a cutting garden. Mature height: 3-4 ft. with a width of 2-3 ft.
Lantana is a favorite among annual flower fans. Each bloom has a complex assortment of colors making this a very interesting addition to a planting. Don’t despair if your lantana seems slow to add new growth in the spring. It’s waiting for the heat of summer to take off. It’s also a very easy tenant in your garden, not requiring an abundance of water, it will live very nicely with the other plants in this design. When lantana flowers begin poking through the lavender nearby you’re going to love the combination. If you are strictly a perennial gardener, coreopsis will be a nice substitute in this spot. Have you noticed that we mention ‘Winter Gem’ often? You’re right! This boxwood has completely won us over. Its color, size, and versatility are just so right for the garden. Make a hedge, a grouping, or plant one as a backdrop for other flowers. You can prune to shape if you desire, but it’s not against the rules to let it look a little bit wild! The bright spring goes-with-anything chartreuse color will go a long way to liven up your garden. Summer brings a deeper green with another bonus of bronzy fall color. Mature size: 3-4 ft. with a width of 4-5 ft.
All of the plants in this design need 6-8 hours of sun a day to bloom well. Make sure to give the plants enough space. Roses don’t like to be crowded so plan on leaving 18″ all the way around the crown. Purchase garden phlox that are disease resistant. Make sure to give the plants enough space. Roses don’t like to be crowded so plan on leaving 18″ all the way around the crown. This design includes plants that spread. Eventually, there will be less separation between them. If you prefer a more delineated look, trimming and thinning can achieve it. Make sure to give the plants enough space. Roses don’t like to be crowded so plan on leaving 20″ all the way around the crown. If you select and older type of rose without a great deal of disease resistance (‘Violet’s Pride’ has great resistance), you may have to leave more space. Consult your nursery person about your rose selection. Salvia comes in different heights and variations of white, blue and purple and can substitute for lavender. 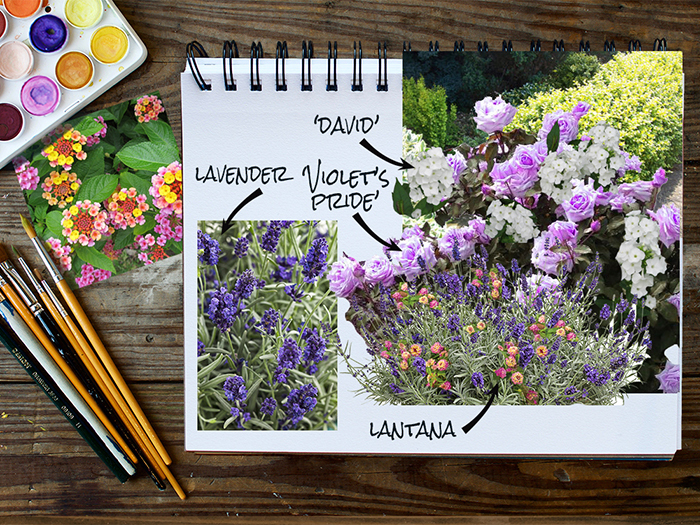 The upright spire shape of lavender and salvia will offset the round blooms of your phlox and roses.